I’m not quite sure what to call this “thing” that I sewed. I’ll call it an obi-style belt for want of a better term. The idea came from a friend, who sent me this photo. I believe it featured in a Tibi shoot. It wasn’t for sale though and only being used for styling purposes. How frustrating for people who don’t sew! I could, however, look at the picture and appreciate that it would take me all of 30 seconds to draft (yes, draft… it’s Tibi after all), and then sew with one hand tied behind my back and one eye shut. It really was that simple. I used a beautifully soft, lightweight rayon jersey that I sewed into a tube with about 1.5 inches of negative ease. I then turned that tube out to the right side, keeping the lengthways seam to the middle, and stitched the short raw ends together. From the outside, your can just see a single seam down the centre-back. The belt needs to stretch a little to pull the shirt in, but you don’t want it compressing your internal organs like a Kardashian. You want it to feel comfortable if you plan on wearing it all day! The width of my band is about 15 inches, so that makes it wide enough to be scrunched down as you see in the pictures. The diagram below shows exactly what I did. My seam allowance was 1/2 inch. I really love the way it looks paired with a crisp, white shirt. It is the perfect accessory for Fall. In fact, it is so perfect, that I decided to make another right away. A smooth, lightweight, merino jersey would have been perfect but I didn’t have any on hand. I did, however, have a small remnant of a wool/acrylic knit. It’s thicker than I’d like (since nobody really wants extra fabric around the waist), but it works out fine if I scrunch it a little less (and it will be super warm too!). I paired it with the same white shirt, and a favourite pair of pants. I made these thick cord culottes a few years ago. I wore them nearly every day during the Winter before last, which was probably why I couldn’t stand the sight of them last year. They were originally shaped more like a skirt. To jazz them up a bit and fall in love with them again, I bought the leg seams in (unfortunately this required a little more effort than planned… ie. moving the side zipper… but it was worth it). Now they have a more boxy, trouser-like shape. I also refreshed the dark colour with a bit of over-dyeing in the washing machine. I love them all over again. This entry was posted in bustier, knit, rayon, tutorials and tagged belt, diy, jersey, obi, sewing, tutorial on September 7, 2016 by Debbie Iles. I’ve been asked quite a few times about a tutorial for this little skort. I decided to go one step better. I digitised the actual pattern piece that I created, with all the sizes graded out to suit everyone! It can be downloaded here. It should match up perfectly with the Esther Shorts pattern by Tessuti Fabrics, but there’s no reason you can’t adapt it to your own TNT shorts pattern by adjusting a few minor details. I really love my white version. It is the second pair I’ve made and it’s seriously one of my best Summer staples ever. The front overlay adds a little formality and cover to a standard pair of shorts. I dress mine up with a blazer and heels. I also wear it out and about with Birkenstocks and a singlet. It’s a style that is very versatile. As I mentioned, my version is based 100% off the Esther shorts pattern. I made a straight size 8, but I did shorten the legs by two inches (whilst maintaining the original hem shape). To achieve the same proportions as me, you’ll first need to shorten the legs of the front and back Esther pattern pieces by two inches. 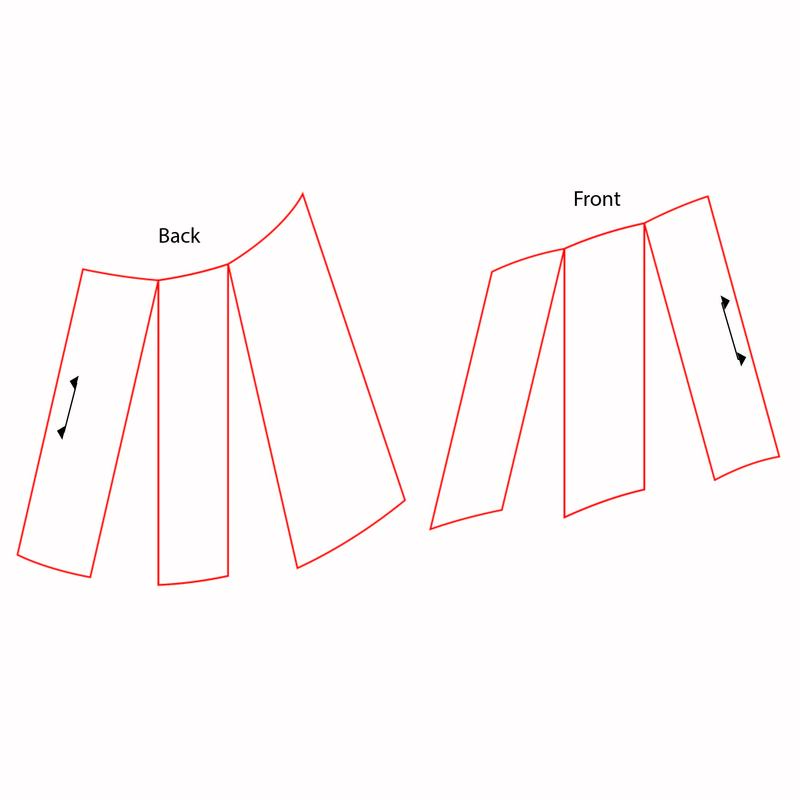 If you want to add this overlay to the longer, unchanged length of the Esther shorts pattern, simply lengthen the skort overlay by two inches at the lengthen/shorten line (included on the skort pattern piece). 1. 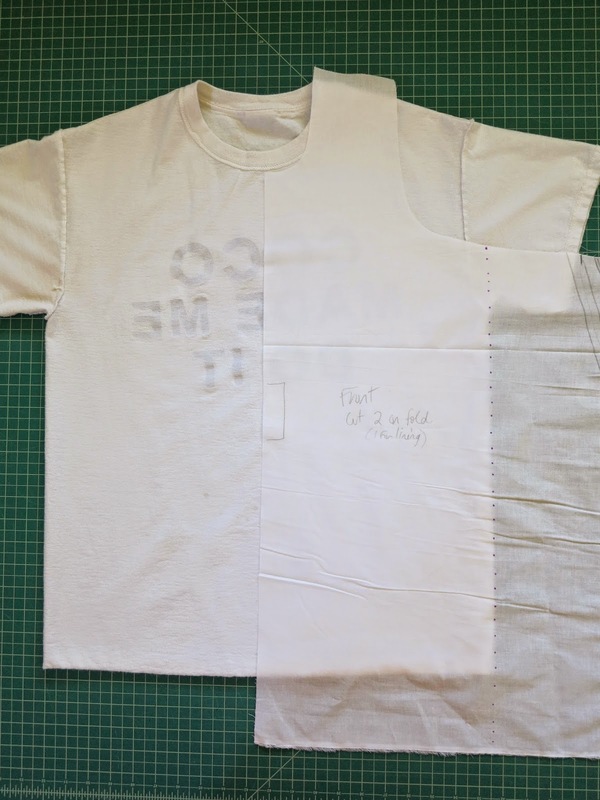 Cut out your overlay fabric: Outer fabric, right side facing up. Lining, wrong side facing up. 2. Prepare the overlay: right sides facing, pin the overlay fabric to the overlay lining. Stitch a 1/2 inch seam along the two angled bottom edges and the left side edge. 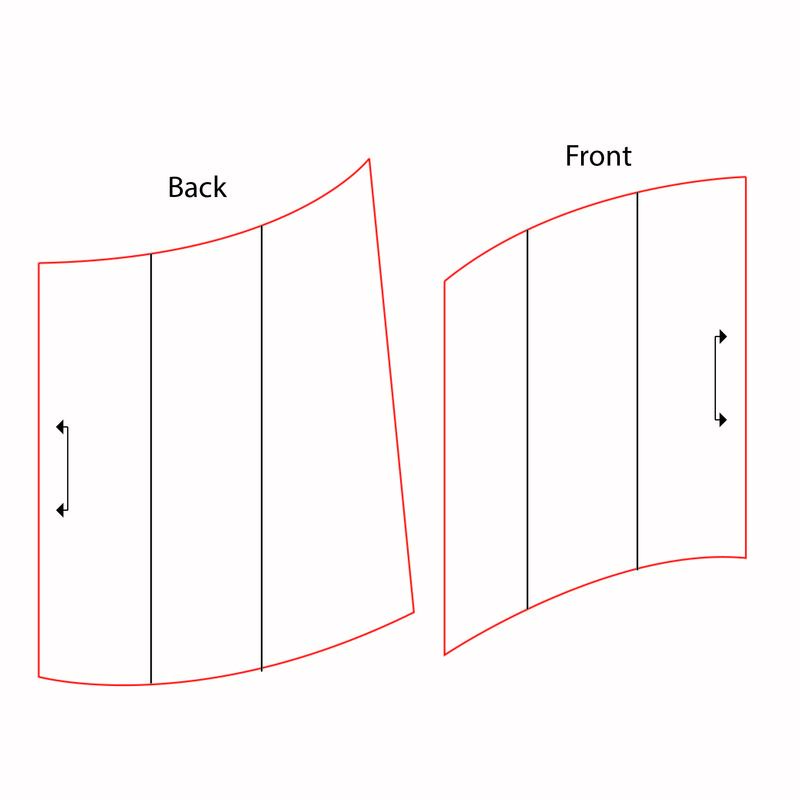 Remember, the diagram below shows the skort overlay as you look at it in front of you, so the left side (as you wear it) will appear as the right. 2. Trim seam allowance and turn the overlay out to the right side. Press. Baste remaining raw edges. Now it’s time to put together the rest of the shorts. I’m just going to summarize the order of construction here. If you need more details, refer back to your actual shorts pattern, but keep following this order of construction. 3. Stitch the left leg seams. 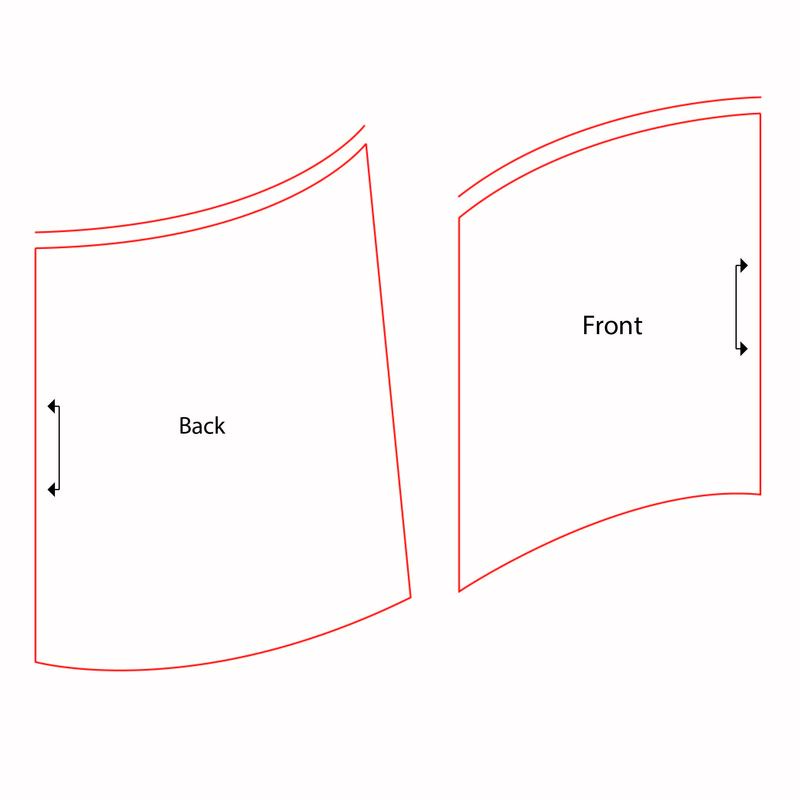 First, insert zipper in the side seam of the left side, between the front and back leg. Complete the stitching of that seam. Then stitch the inner leg seam of the left leg. 4. Now onto the right side. Sandwich the side seam edge of the overlay between right front and right back leg side seam. Wrong sides of front and back legs facing the right sides of the overlay. Stitch. Finish raw edge. 5. Fold the overlay piece up so it’s not in the way, and sew the inner leg seam of the front and back leg. 6. Keep the overlay piece folded in and out of the way. Wrong sides facing, inner seams matching, now sew the crotch. Finish raw edge. Turn the shorts out the correct way. Press. 7. 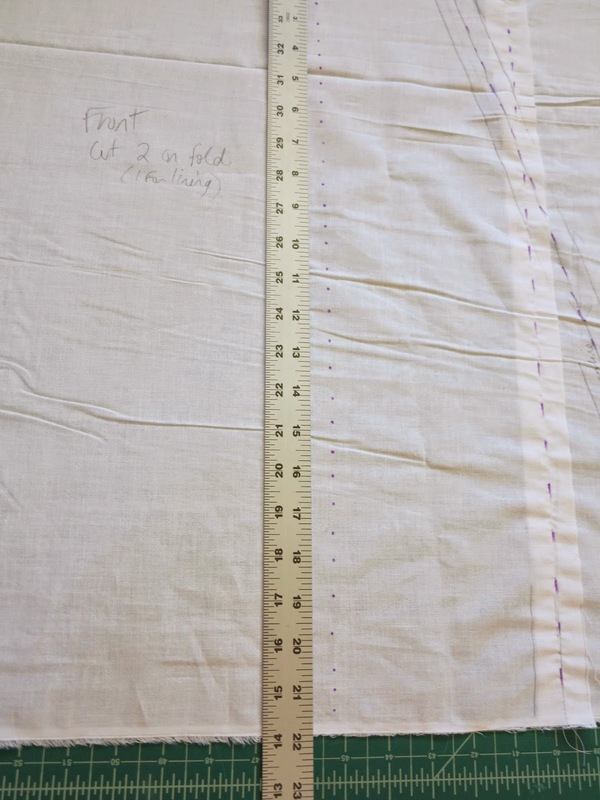 Unfurl the overlay piece and straighten out the waist edge so it lines up with the front waist edge of the shorts. Baste in place. Now, simply continue as your original pattern instructs. Attach the waistband and hem your new skorts. I usually serge the raw edge of the hem and then fold it up to the point at which the overlay ends at the side seam. I hope you enjoy your Esther Skort as much as me! This entry was posted in cotton, Esther shorts, pants, shorts, skirt, skort, Tessuti patterns, tutorials, white and tagged diy, Esther shorts, free pattern, pdf, sewing, sewing pattern, shorts, skort, tessuti pattern, tutorial on August 27, 2016 by Debbie Iles. And here it is. Apparently I’m not the only one who’s had the idea of turning the gathered section of the Wonderland skirt into a flounce. I’m going to show you how to do it. It’s a very simple modification once you know what to expect. 1. Fit and sew the yoke (in it’s entirety). The design of the yoke is very, very subtly A-line. It’s possible to peg it in a little, but be sure to record those changes on your pattern pieces first, so you can draft your flounce correctly. 2. Once you have the yoke fitting as you’d like, you are ready to draft the flounce. 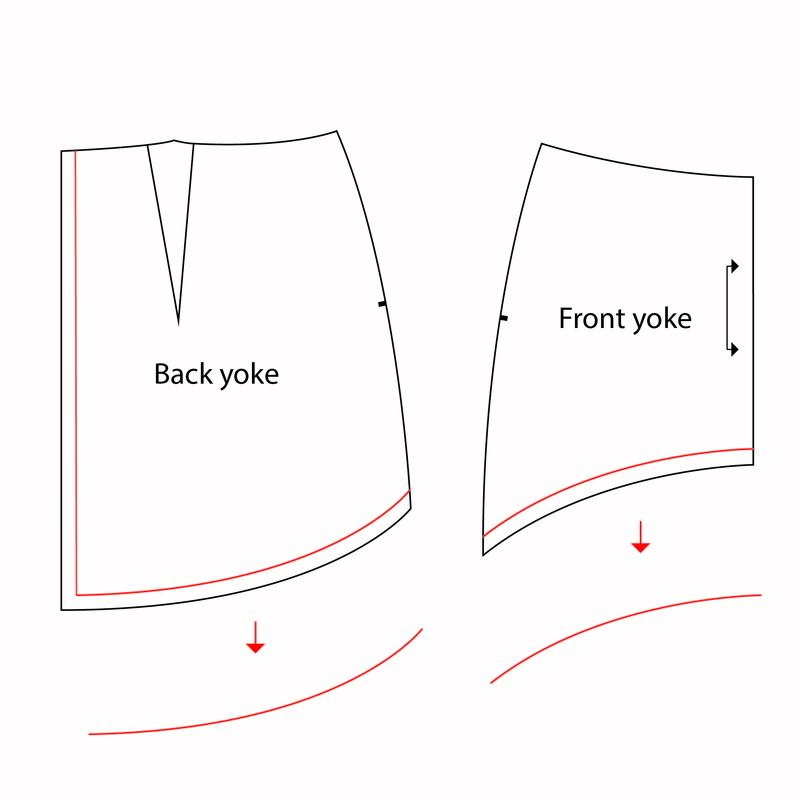 On the bottom of the back and front yoke pieces, draw in the 5/8 inch (16mm) seam allowances (I’ve used red in the diagram) for the bottom and the centre back (CB) of the back yoke. There’s no need to worry about the centre front (CF) on the front yoke because it was cut on the fold (without a seam allowance). 3. 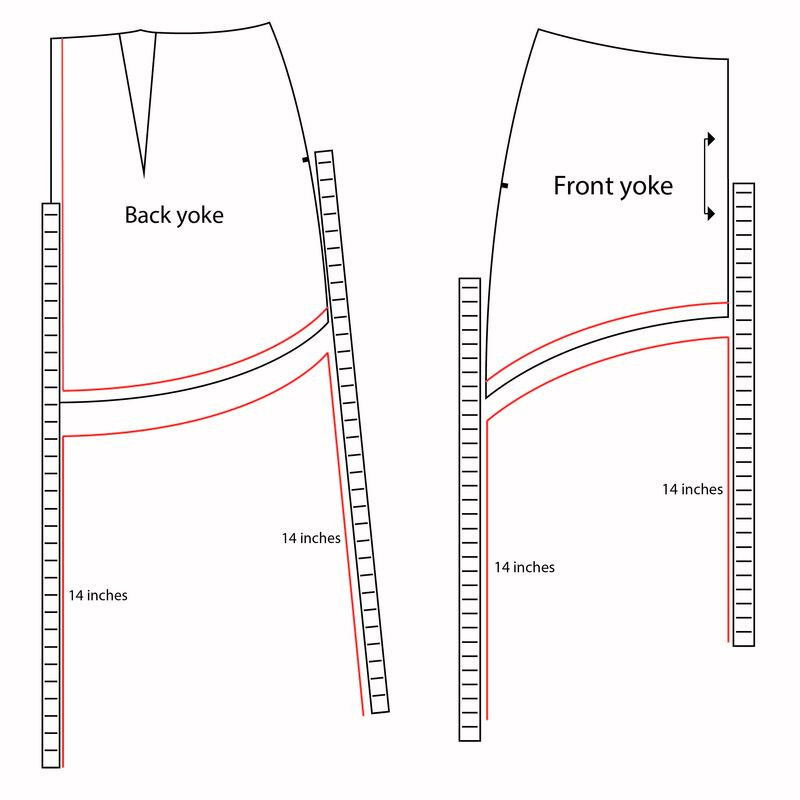 On a large piece of paper, trace the bottom seam allowance (in red) of the yoke. This will become the top seam line of the flounce. It makes sense that you’d want the top of your flounce to be exactly the same length as the bottom of the yoke because you will want your seams to match up when you sew them. Pay attention to the CB and CF seam allowance. In the original pattern, the Front Yoke is cut on the fold. The Back Yoke is cut as two pieces. 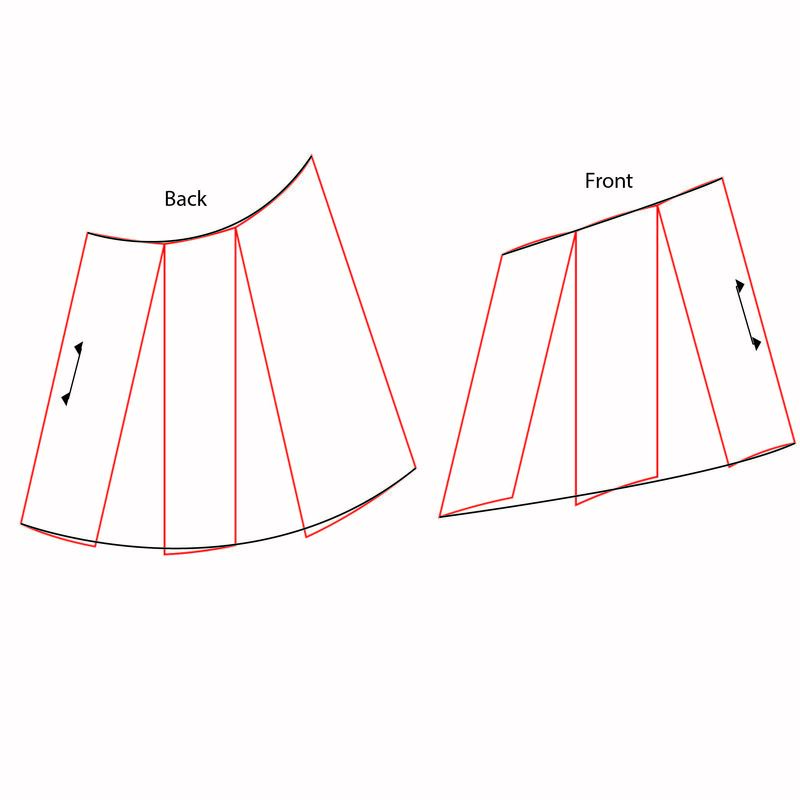 If you want to cut the back skirt on the fold too, you will need to subtract 5/8 inch (16mm) from the red line you draw. This might depend on how wide your fabric is. 4. Line the ruler up with the bottom of the yoke and use it as a guide to smoothly extend the side seams and CB/CF seams of your flounce. Imagine you are just making the yoke longer. 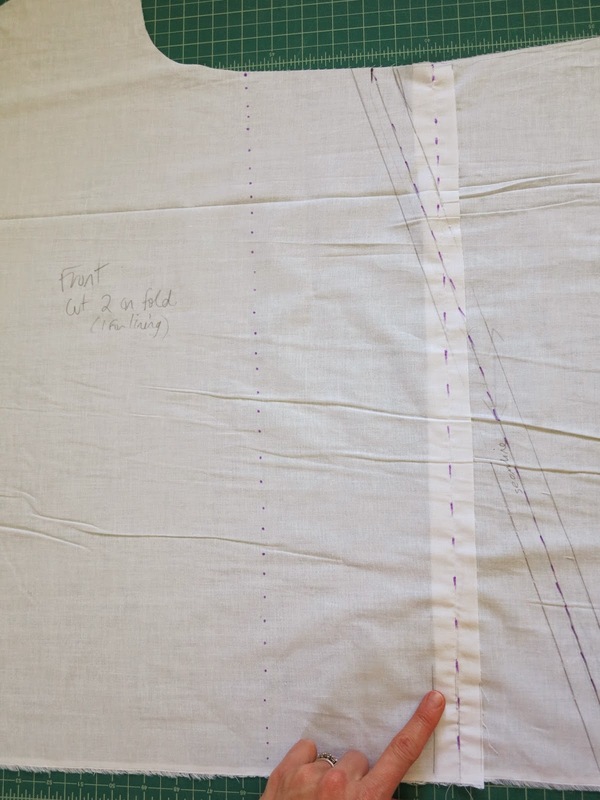 Decide how long you want the flounce to be and extend the side seam and the CB/CF seams all by the same amounts. My flounce is about 14 inches long (but this might still come to below the knee on some). 4. Draw in the bottom of the flounce. Try to mimic the curve at the top of the flounce and measure along the way so that the entire flounce is the same length. It’s also a good time to draw in the top seam allowance (then join it up with the side seams – I haven’t joined mine up in the diagram). Also make some markings on the pattern pieces (they are a bit oddly shaped so do this before you forget). If you attached the pieces you have just drawn, you would have a straight (ever so slightly A-line) extension of the yoke. However, we want a flounce, so now we need to add some flare. You can add as much or as little flare as you like. I’m going to show you what I did. 5. Use a ruler to draw two straight lines, vertically down the flounce pieces, to make a division of three. Space them an even distance apart, but you don’t need to measure. 6. Now you are going to slash and spread those lines to create a flounce. Cut along the black lines from the bottom to the top, BUT stop just before you cut through the top. The top will be your pivot point. Place some paper underneath your pieces and spread them by as much as you want. I spread each slash by about 1.5 inches (16mm). You could spread them by more than this or add an extra slash to make your flounce more dramatic. Tape the spread pattern pieces onto the paper. Because of the curved shape of the yoke, the front and back flounces will look quite different. 7. Draw in smooth curves for the top and bottom of your flounce pieces. Congratulations! You now have flounce pattern pieces that will perfectly fit the yoke of your skirt. This entry was posted in cotton, cropped, fabric, Lily Sage & Co patterns, Mood Fabrics, skirt, Tessuti Fabrics, top, tutorials and tagged cotton, flare, flounce, Mood fabrics, skirt, Tessuti Fabrics, top, tutorial, white, Wonderland skirt, yoke on June 3, 2015 by Debbie Iles. So I stumbled across this amazingly simple, yet stunning white top on The Man Repeller the other week. I couldn’t get it out of my head, so I decided to make it! I made the linen pants too, Chado Ralph Rucci V1347, modified for use as pyjamas, post photo shoot. But I’m not here to talk about them, other than to say they are a fabulous, wide leg, elastic waist pant if that’s what you are after. I’ve made them before. They make the best PJ pants ever, especially in linen. Like my last version, I simply skipped the pockets and the lining, and cropped them A LOT. I’m also not going to talk much about the fabric, other than to say that I won’t be buying this particular linen again. It’s Kaufman Brussels Washer Linen Blend in white from Fabric.com. It’s ok. Their service was great and the description reasonable. But I have to say that I was still quite disappointed when it landed on my doorstep. It is lighter than I expected and blended with rayon (how did I miss that?). Personally, it isn’t really of a quality I would be happy to use for outerwear, but lining it certainly helps. I should also say that I think I’ve been incredibly spoilt for quality with the linens I’ve used in the past, mostly from Tessuti Fabrics and sometimes from The Fabric Store. Linen is a very tricky fabric to purchase, especially unseen, because of the vast differences between one type and the next. You really do need to see it and feel it in person. But let’s get back to this top and talk about how it can be made. My brain doesn’t picture pattern pieces well right off the bat. 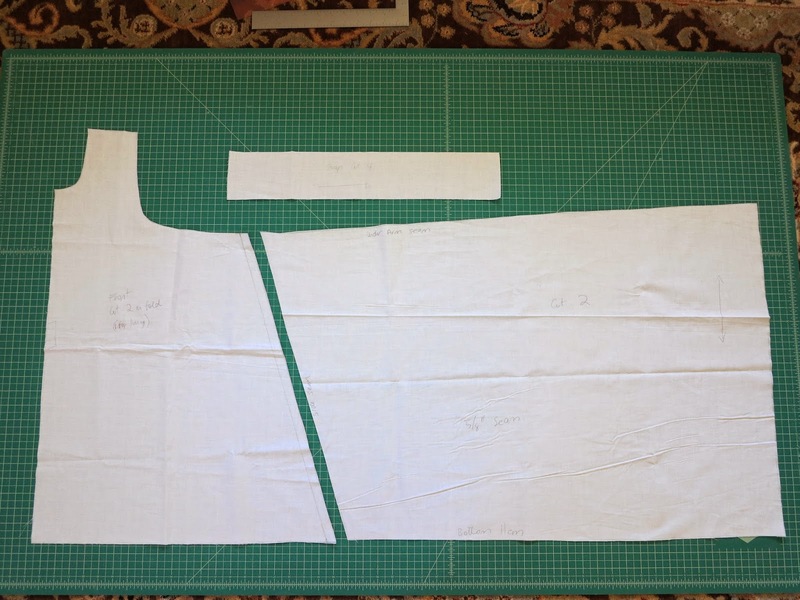 For new-to-me or unusual designs, I need to drape calico onto my dressmaker’s dummy to better understand the shape of the pieces and for my head to figure out how they will come together. Then I take my rough marked calico to the floor or the cutting mat, to modify and make further adjustments from there. I began creating this top by draping it. I knew the design was going to be simple, but it was even more basic than I could imagine. So basic, in fact, that I was also able to work backwards on the design, to show you how it can be done even easier. Forget about draping! 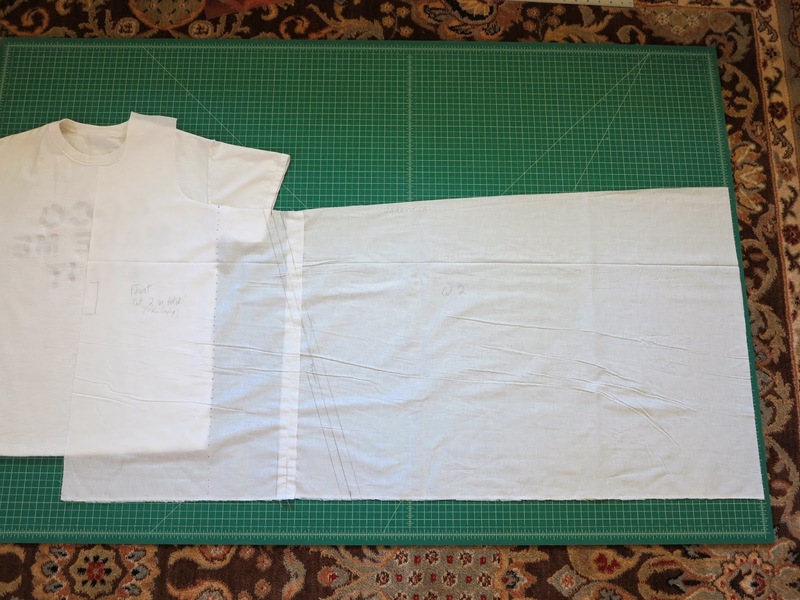 All you need is a basic T-shirt, woven or stable knit (without darts), to use as a template. Grainline’s Scout Tee also comes to mind as a suitable pattern that you could modify. To give you an idea of fit, you can see me wearing the T-shirt I used here. I’m going to explain the pattern pieces in this post. I’m pretty sure most of you will be able to put the top together with just this. But if you need more instructions, just let me know. I’m planning another top already so I can photograph it through the construction stages next time if I get enough interest. The top itself consists of three main pattern pieces: the front bodice, the side drapes, and the straps. You can probably already see how you would put it together. 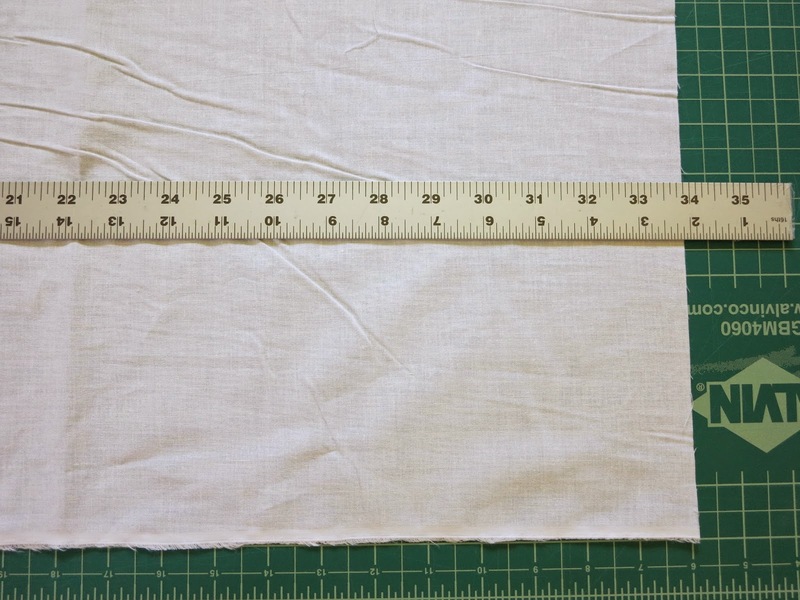 So to work out your measurements, start with a basic T-shirt. Lay it nice and flat with the front facing up. You’ll need some tracing paper and long piece of calico. 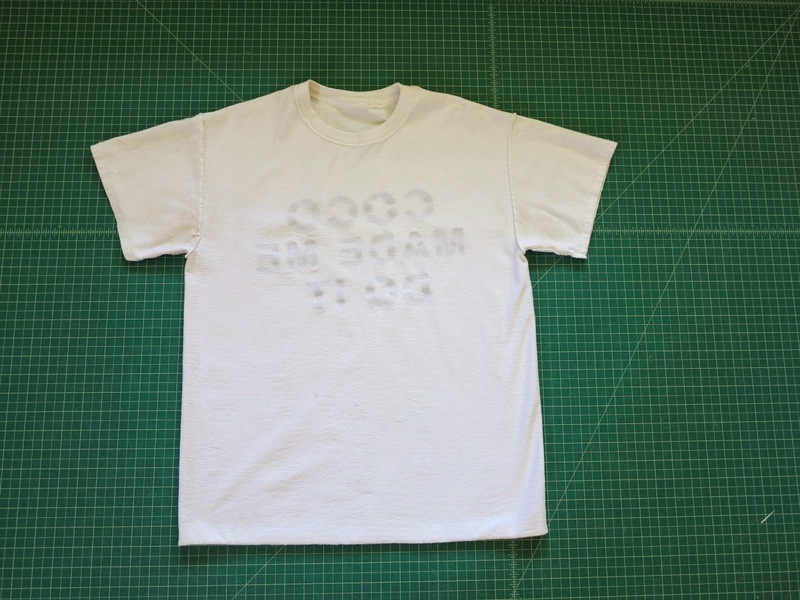 Lay the tracing paper on top of the T-shirt. You need to trace around half of the front piece. I forgot to photograph this stage, but you can easily see what I did below. Mark the CF, the neckline, the armscye, and the side seam. Also mark the length, as this can be useful in identifying where you want your new top to sit. lift the underarm seam (bottom of the armscye) by 1-2inches, depending on how your original T-shirt fit. Mine was quite loose to begin with. re-draft the neckline and shoulder seams to fit the shape you want. It doesn’t matter how wide or narrow you want those shoulder seams to be either. You can see how the entire pattern piece looks below before you add a side seam. You can also see where my pieces have been basted together. 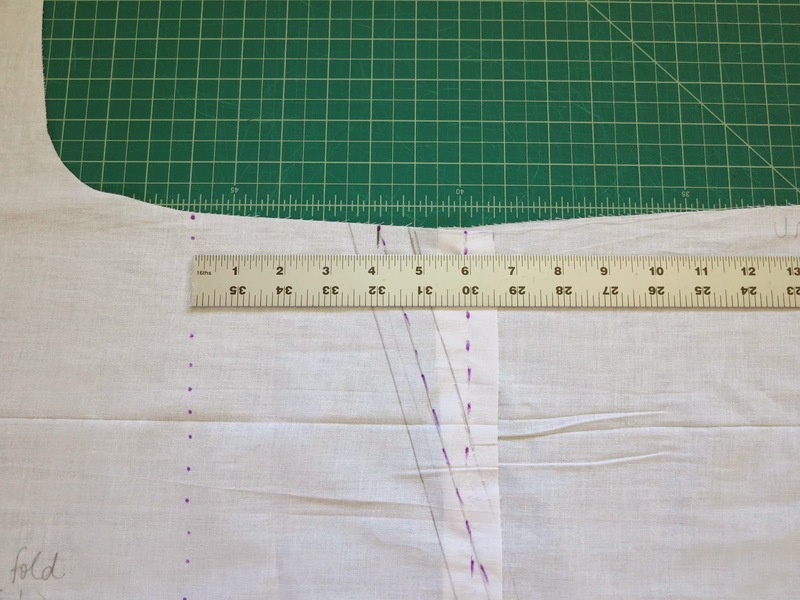 Use the side seam you marked from your T-shirt (purple dots) as a guide to measure your new seam from. In my finished top, my side seam was cut parallel and 6″ from the original side seam. 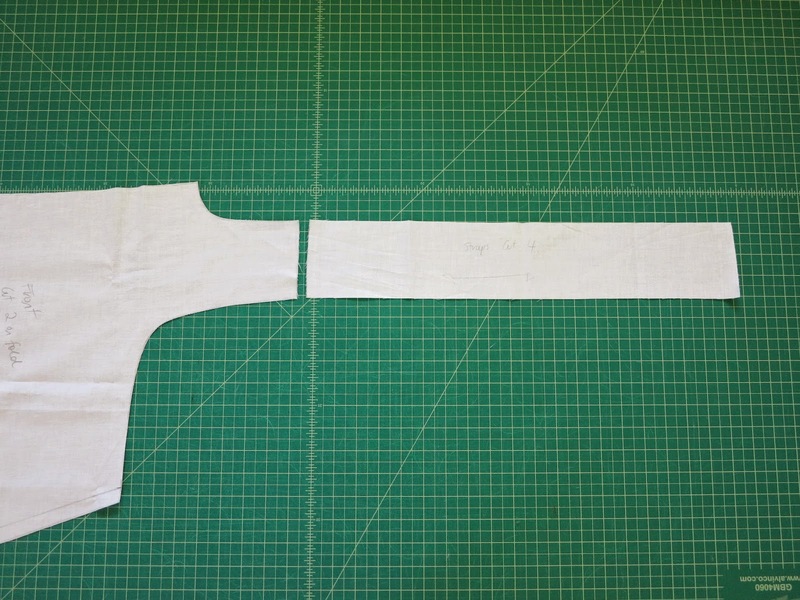 Cutting it straight like this means that your new side seam will hang on a diagonal when you are wearing the top. 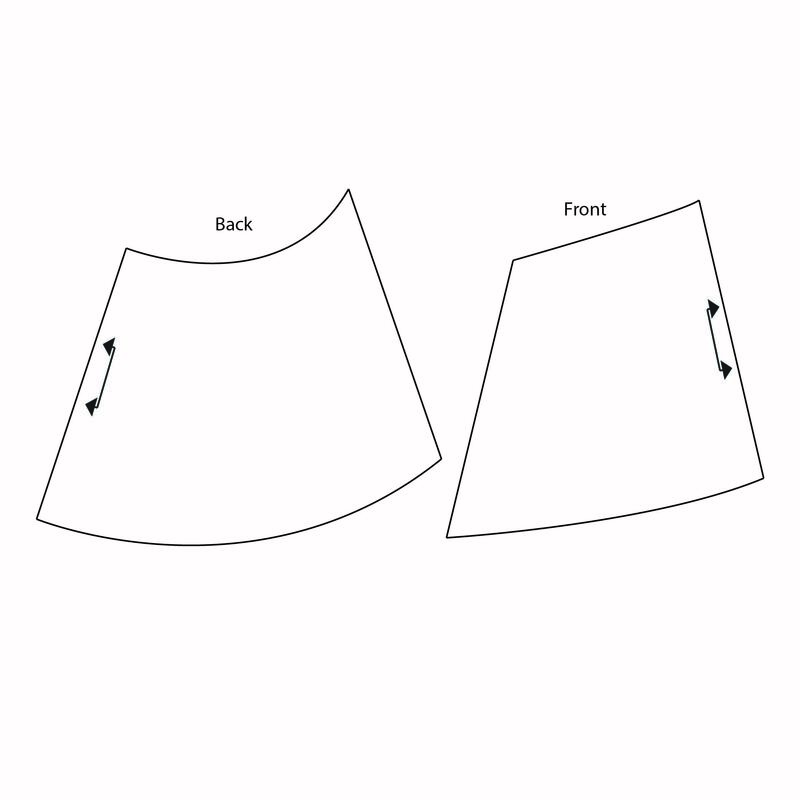 I don’t mind the angular look of this, but I’d prefer my side seam to hang straight up and down, perpendicular to the ground, so I’ve drawn a new side seam for my next version. It will be about 4″ from the original line and run on a diagonal (marked in black). It’s not essential that you mark your side seam in exactly the same place as me. The nature of the top is that it drapes and the fit is pretty flexible. But as a guide, if you are bigger than me, you may want to increase the distance to your new side seam a little, and if you are smaller, then perhaps narrow that distance a little. Also keep this in mind for when you draw up the side pieces and straps. FYI my bust measure is 35″ and my waist is 27″. I am 5″10 or 178cm tall. The next step is to decide on how long you want the top. Mine was 22″ in length along the side seam including a 1″ hem. This measurement determines how low the top will sit in the front. The side pieces simply extend straight out from the front bodice. You could just make this a big rectangle. I sloped my top edge up a little so it finished 2″ higher at the far end. My side pieces are about 34″ in length. How long you make this piece will depend on how long you want it to drape down at the back. Finally, to draft your shoulder straps, just line them up with your bodice shoulder seams to determine the width. They can be as long or as short as you want them to be. I made mine about 20″ in length. 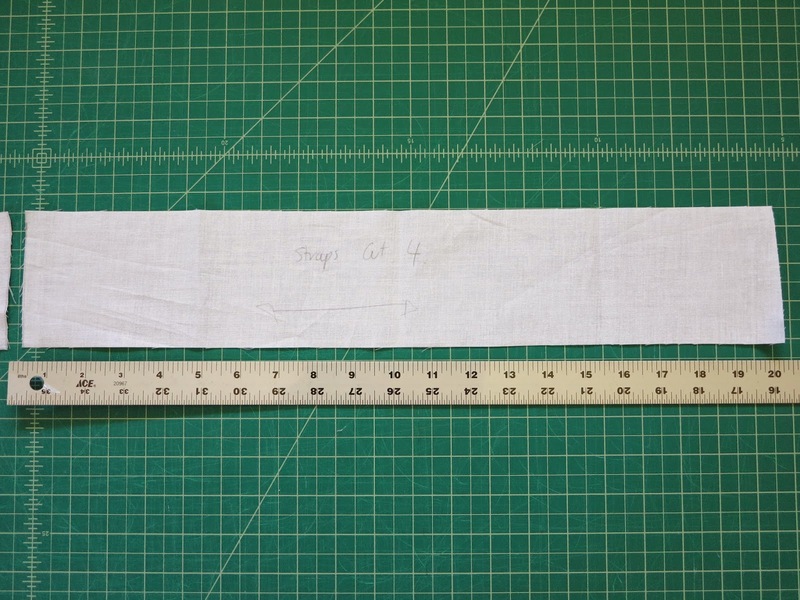 The seam allowance I used in making this top was 5/8″. I sewed the bottom of my shoulder straps straight onto the top but you could attach yours with buttons. You could also close the back seam up if you want, by overlapping it, or sewing a seam down the middle. I might try doing this next time to make a dress out of the pattern instead. This entry was posted in dress, linen, pants, sleepwear, top, tutorials, V1347, white on April 1, 2015 by Debbie Iles.